The movement against Hungary’s prime minister Viktor Orbán returned to the streets of Budapest on Saturday 5 January. Over 10,000 joined a march from Heroes Square to rally outside the Hungarian Parliament. What began as protests against the government’s new employment laws, dubbed the “slave laws” – see our eyewitness reports here – has now become a movement to kick Orbán’s authoritarian far right populist government out of office. Orbán is nervous. For the first time since his initial election victory in 2010 the trade unions are threatening a general strike while the anti-government protests have broken out beyond the capital. In the run-up to Saturday’s protest more than 3,000 rallied in Pécs, another 2,000 in Szeged and more than 500 marched in Tapolca, Szolnok, Hódmezővásárhely and Békéscsaba. On Saturday there were rallies in Sopron, Szombathely, Zalaegerszeg, Vác, Kecskemét, Orosháza, Debrecen and Nyíregyháza. Like the first anti-government protest on 8 December 2018 there were large numbers of trade unionists on the protest. I saw groups of mineworkers, meatpackers, chemists, teachers and metalworkers. They were chanting for a general strike. The union leaders supported the calls of the workers. Speaking at the rally, László Kordás, president of the Hungarian Trade Union Federation (Magyar Szakszervezetek Szövetsége – MASZSZ), gave the government five days to meet with the trade unions. The unions are calling on the government to end the “slave laws”, introduce higher wages, withdraw the anti-strike laws and lower the retirement age for workers. The unions’ warning strike could be strengthened by more protests. All the parties, unions and civil groups have called for further united marches on that day. Although the Budapest demonstration was large by Hungarian standards – over 10,000-strong – it was not as big as hoped for and was not as militant as the December protests. On previous protests unofficial actions, such as blocking bridges and surrounding TV stations and other key buildings, took place. This time the unofficial protests were much smaller. The police were able to kettle and ID those of us who had tried to occupy Margaret Bridge. This has scared many activists. Finally Jobbik supporters attended the main protest in even larger numbers and are leading protests in small towns. My friend who attended a Jobbik-controlled protest in Kaposvàr said the Jobbik speakers were much more nationalistic and aggressive than the Jobbik speakers in Budapest. 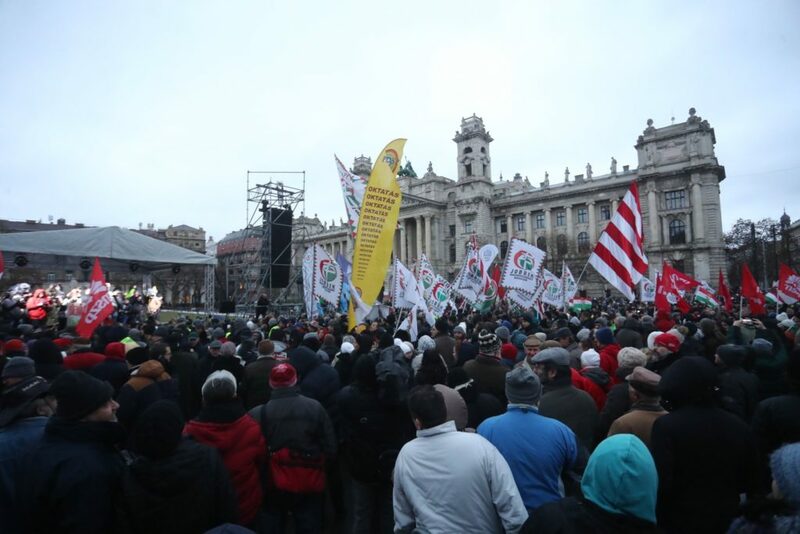 It is a very mixed picture – with the strike calls on one hand and the presence of the fascist Jobbik on the other. Here, we look at some of the key issues the meovement faces. Orbán understands only too well that a general strike and further mass protests could bring his government down. His ascent to power came off the back of the 2006 revolt that shattered the then centre-left MSZP-led government, paving the way for the rise of Fidesz. But an escalation of the protest movement cannot be guaranteed. The union leaders have talked about calling a general strike since 10 December. But they have delayed calling the action and are clearly nervous about breaking the anti-union laws that make effective action very difficult. Saturday’s announcement of warning strikes should be welcomed – but two of the union leaders on Saturday’s protest made it clear that if Fidesz agreed to meet the unions the action would be called off. And 19 January is a Saturday – not the most effective day to stage a strike. Over the years Orbán has been very adept at dividing his opponents – he has pitted the people against the elites, urban communities against rural, agricultural communities and “Hungarians” against refugees and Roma people. Any delay in calling strike action could undermine the movement and enable Orbán to split the workers away from the street movement. The movement has united all of Hungary’s opposition parties. This coalition is very broad and includes the MSZP (centre-left social democrats), Párbeszéd, DK and LMP (Green type parties), the non-parliamentary liberal-conservative Momentum Movement, the Hungarian Two-Tailed Dog Party (a parody party) and the fascist Jobbik, which is the second largest party in Hungary’s parliament. All these parties have united to declare an oath to be “faithful to the goals of resistance and the five-point demands of the Hungarian people”. This unity is widely perceived as a strength – but it also embeds serious weaknesses that are a major problem for the movement. The cross-party coalition has been able to sideline the local committees of action and student groups that have developed over the past year in Hungary. It has taken over the leadership of the movement. The coalition has consciously dampened down militancy and undermined the more hard-hitting protests. It is also trying to steer the action away from street protests and towards a united electoral coalition against Orbán and Fidesz. On Saturday’s demonstration, MSZP speaker Bertalan Tóth called for a joint oppositional electoral slate – including Jobbik – to oppose Fidesz. Such a slate, if it came into being, would be unable to agree on a political programme other than one which supported the continuation of neo-libral policies and would cement Jobbik as major force into the government. This leads us to a key problem – the role of the fascist Jobbik party. The opposition coalition has, with a few notable exceptions, enabled Jobbik to play a significant role in the movement and has allowed its representatives to speak at the rallies. Jobbik MP Jakab Péter has become one of the key speakers of the movement while another Jobbik MP, Andrea Varga-Damn, is being promoted as a spokesperson for the “White Hat Group” of women involved in the protests. Allowing Jobbik to play a part in this movement legitimises the party and allows it to insert its toxic ideas into the movement. Jobbik is a fascist party and a virulently racist organisation that promotes anti-Roma racism and ultra-nationalist ideas. István Földi, a Jobbik mayor, boasted to the media that if Fidesz is broken by any protest movement Jobbik could become the largest political party in Hungary. No one should be surprised to hear Jobbik officials claiming that it is no longer a fascist party. Just like the French Rassemblement National (formerly known as the Front National) and the Sweden Democrats, Jobbik has been prepared to water down its policies in public to make it more electorally palatable. But, as with the RN and SD, Jobbik’s core aims remain behind the slicker, more “acceptable” public veneer. Over the past few years Europe has witnessed a number of anti-establishment movements in which fascist and far right groups have attempted to infiltrate or even take the lead. We have seen this from Ukraine’s Euromaidan revolution in 2014, where fascist organisations were able to play a leading role, to today’s Gilets Jaunes (Yellow Vest) movement in France, where the fascists have been challenged and thrown out of the protests in cities such as Paris. And of course an important precedent is the role of both Fidesz and Jobbik in the Hungarian revolt of 2006. The fascists and far right have attempted to use these movements to build up their support and break their opponents. This is a new and worrying development that poses a number of problems for emerging protest movements in countries where the far right is strong. That said, when Fidesz won its super-majority in the Hungarian parliamentary elections in April 2018, many political commentators argued that Orbán and his party were in an impenetrable position and would govern Hungary for another decade or more. Over the past month workers and students in Hungary have shown that even the most authoritarian of governments can be challenged and, hopefully, in the weeks ahead can be defeated. But the danger of the fascist Jobbik should not be ignored or underestimated. 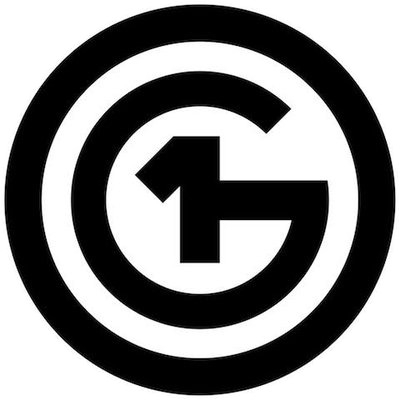 The O1G badge worn by many activists. It roughly means Orban is a wanker. Contact Dream Deferred via this website or our Twitter or Facebook pages if you would like one.